Travis at Katy trail were built in 2001, and is a midrise building located in the heart of uptown bordering Highland Park. Its situated just off the Katy Trail and a prime location to walk to several restaurants, and shops along the Travis Knox street neighborhoods. The Travis offers panoramic views of Downtown Dallas and has 61 condo units that are one & two story. 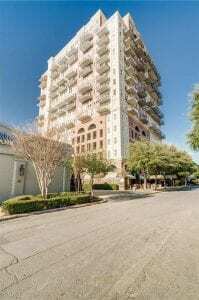 The building is a 17 story highrise with pool, fitness and concierge. This is one of Dallas’s best condo buildings with views of Highland Park, Turtle Creek and Downtown Dallas.